TV sensation Mouni Roy, who rose to fame with her hit TV show Naagin, made her Bollywood debut earlier this year in Akshay Kumar’s Gold. The actress has since bagged one more film- Ayan Mukerji’s Brahmastra which stars Ranbir Kapoor, Alia Bhatt and Amitabh Bachchan. 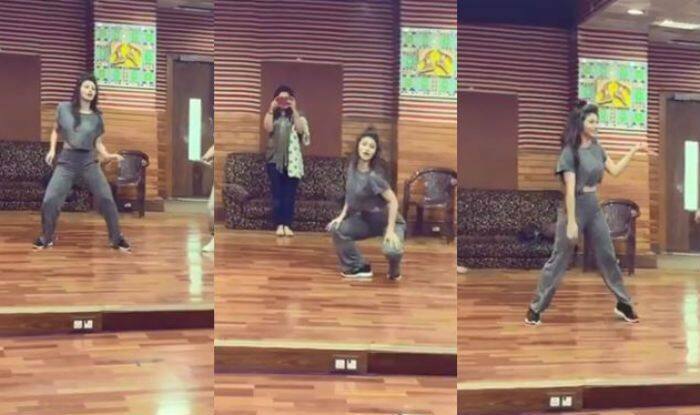 Apart from being an actor par excellence, she also dances so well and shares dance videos on her social media accounts which reveal that she is quite a talented and versatile performer. Well, the actress recently took to her Instagram account to share a video of herself, sensuously dancing to the song ‘Akh Lad Jaave’ from Loveratri starring Aayush Sharma and Warina Hussain. She captioned the video as, “Too sleepy to read so; Love Language !! ✨. #rehearsals #day1 #soon @sonyamagic”. Mouni first made her entry into the world of acting with Ekta Kapoor’s Kyunki Saas Bhi Kabhi Bahu Thi. She later went on to win over the hearts of the viewers with her role as Shivanya in the supernatural thriller titled Naagin. She is currently in Bulgaria shooting for her upcoming film, Brahmastra, helmed by Ayan Mukerji, starring Ranbir Kapoor and Alia Bhatt in the lead. She is expected to play a negative character in the film. The film is expected to release on August 15, 2019. Besides, she will also be seen as Akshay Kumar’s on-screen wife in Reema Kagti’s Gold that’s slated to release on Independence Day this year. She is also rumoured to be starring as the female lead opposite John Abraham in the upcoming film Romeo Akhbar Walter. Mouni has performed a sizzling item number in the upcoming Kannada film KGF (Koler Gold Fields) which stars Yash in the lead.